for the finest in rehabilitation, Ophthalmic Prosthetic, and facial prosthetic publications. AVAILABLE NOW FROM VANDAMERE PRESS…. … A famous philosopher told us we're doomed to repeat history if we don't learn from it, which makes Gerry O'Reilly's book a must-read. A full-fledged member of the Greatest Generation, his experiences included some of the 20th century's most seminal events, revered institutions, and colorful neighborhoods. This personal narrative is both informative and entertaining in a way that unfortunately is fast-disappearing in history books and classrooms. Growing up in Brooklyn's Park Slope section in the late 1920's and 1930's, Gerald Ambrose O Reilly had a childhood that would be the envy of many today--filled with baseball (the Dodgers, of course), nuns, trolleys, school, church, and streetball. He was the son of a prominent Wall Street banker and grandson of a U.S. ambassador who served three presidents. As a good Catholic boy he attended Saint Savior and Brooklyn Prep before leaving for college at Notre Dame. He dropped out of Notre Dame at the height of World War II to join the Army and eventually became a member of the storied Tenth Mountain Division. Nine days after sailing from Hampton Roads, The Eighty-Fifth Infantry of the 10th Mountain Division arrived in Naples, Italy. Almost immediately, they were moved inland and began fighting. Their first major engagement was the taking of Mt. Belvedere, which had withstood two earlier assaults by the British and Brazilians. The 10th Mountain Division continued to fight their way northward crossing the Po River, finally making a dash across the Po Valley to keep the retreating German Army from escaping through the Alps. With victory in Europe and the dropping of the Atom Bomb on Japan, the Tenth Mountain Division returned to the states. Join Gerry on his journey, and learn how this trolley-dodging, stickball kid from Brooklyn became part of a specialized group of mountain warriors, who triumphed over their German nemesis in the Alpines of Italy during a critical juncture of the Second World War. The story of a generation, and complete with photos and maps, Nuns, Nazis, and Notre Dame is a rare glimpse of life in a very different time. Tim Pletkovich attended Eastern Illinois University and has enjoyed a variety of careers since graduating in 1982. After college, his first job was as a scout for the Chicago Cubs, where he became the youngest scout in the major leagues. In 1985 he entered broadcast journalism as a radio analyst, covering the Boston Red Sox in New England. In 1987 he turned to education and started his teaching career in Queens, New York. While in New York he began his graduate studies at Fordham, later transferring to Illinois State University. While in the graduate program, he developed an interest in researching primary source documents relating to social issues in the post-Civil War America. Articles resulting from his original research have been published in numerous historical publications. When not writing or lecturing, he is an avid tennis player. 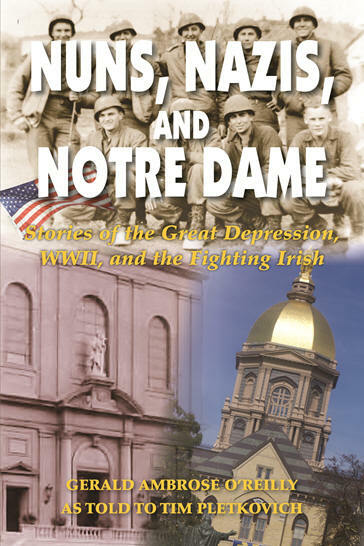 Nuns, Nazis, and Notre Dame is his second book. . Please see the link at the left of the screen for ordering and shipping information.